The Islamic Republic of Pakistan celebrated 50 years of independence in 1997. Those years have often been turbulent ones, given that military rulers have remained heads of state for 28 of those 50 years. This fact has affected the press and laws governing the press in Pakistan. In 1947 when the British agreed to partition British India into the two self-governing countries of India and Pakistan, only four major Muslim-owned newspapers existed in the area now called Pakistan: Pakistan Times , Zamindar , Nawa-i-Waqt , and Civil and Military Gazette , all located in Lahore. However, a number of Muslim papers moved to Pakistan, including Dawn, which began publishing daily in Karachi in 1947. Other publications moving to Pakistan included the Morning News and the Urdu-language dailies Jang and Anjam . By the early 2000s, 1,500 newspapers and journals exist in Pakistan, including those published in English, Urdu, and in regional languages; and the press remains strong and central to public life in spite of government efforts to control it. As of July 2001, Pakistan's estimated population stood at 144,616,639, with men slightly outnumbering women. Ethnic groups within the population include Punjabi, Sindhi, Pashtun (Pathan), Baloch, and Muhajir (immigrants from India at the time of partition and their descendants). Although Urdu is the official language of Pakistan, only about 8 percent of the people speak it. Forty-eight percent speak Punjabi and 8 percent speak English, which is considered the lingua franca of Pakistani elite and most government ministries. Other languages include Sindhi (12 percent), Siraiki (a Punjab variant; 10 percent), Pashtu (8 percent), Balochi (3 percent), Hindko (2 percent), Brahui (1 percent), and Burushaski and others (8 percent). Pakistan's press reflects this language diversity. Newspapers that publish in Urdu, the national language of Pakistan, have a broader reach than the English-language papers. According to London's Financial Times , the combined circulation of Pakistan's entire English-language press is no more than 150,000 in a population one hundred times that size. In terms of distribution, the English-language papers seem to be skewed toward the more liberal elite whereas the Urdu press appeals to the masses and includes scandal sheets as well as respected journals, religious papers, and party organs. Literacy seems to play a part in this distribution pattern. Only 42.7 percent of the Pakistani population (age 15 and over) can read and write. However, many adult literacy centers have been established in recent years; in addition, the People's Open University was opened at Islamabad to provide mass adult education through correspondence and the communications media. The press in Pakistan holds significant power and has suffered much under various political leaders, only to emerge resilient and more committed to freedom of speech. The press's existence is remarkable given the often harsh means used by government officials and military dictators to control it. The press is, in fact, central to public life in Pakistan because it provides a forum for debating issues of national importance. As the national English-language daily The News notes, "[The press] has in fact replaced what think tanks and political parties in other countries would do. Columnists engage in major debates and discussions on issues ranging from national security to the social sector." The competitive nature of politics helps to ensure press freedom, because the media often serve as a forum for political parties, commercial, religious, and other interests, as well as influential individuals, to compete with and criticize each other publicly. Islamic beliefs, which are taught in the public schools, are widely reflected by the mass media. Although the press does not criticize Islam as such, leaders of religious parties and movements are not exempt from public scrutiny and criticism. The press traditionally has not criticized the military; the Office of Inter-Services Public Relations (ISPR) closely controls and coordinates the release of military news. In general, the quality of journalism is high. English language newspapers tend to present more foreign news than Pakistani papers in other languages. The typical Pakistani newspaper is of regular rather than tabloid size, averaging about 20 pages per issue. Most newspapers have a weekend, midweek, and magazine section. All the leading newspapers, including Jang , Nawa-e-Waqt , Dawn , The NationThe News International , and Business Recorder , have online editions. The All-Pakistan Newspaper Society (APNS) estimated that the total combined circulation figure for daily newspapers and other periodicals was 3.5 million in 1997. Print media included 424 dailies, 718 weeklies, 107 fortnightlies, and 553 monthlies. Deficient literacy rates, urban orientation of the press, and the high price of newspapers are considered primary factors contributing to low circulation rates. Jang is the top daily newspaper with a circulation of 850,000. Nawa-e-Waqt holds second place with 500,000, followed by Pakistan (279,000), Khabrain (232,000), The News (120,000), Dawn (109,000), and Business Recorder (22,000). The three most influential newspapers in Pakistan are the daily Dawn in English, the daily Jang in Urdu, and the daily Business Recorder in the area of business and finance. The average price of a newspaper varies from Rs 5 to Rs 15. For example, Business Recorder costs Rs 7 per issue. Pakistan is a poor, heavily populated country, and the welfare of its people is severely affected by internal political disputes, lack of foreign investment, and ongoing problems with neighboring India. The majority of Pakistan's citizens are heavily dependent on agriculture for employment. Despite steady expansion of industry during the 1990s, Pakistan's economy remains dominated by agriculture. In 1998, agriculture engaged 47 percent of the labor force and accounted for 24 percent of the gross domestic product as well as close to 70 percent of export revenues. Despite strong performances in the industrial and agricultural sectors, a growing debt-servicing burden, large government expenditures on public enterprises, low tax revenues, and high levels of defense spending contributed to serious financial deficits. Besides a select few major groups, Pakistani media organizations face chronic financial problems. Newspapers are heavily dependent on advertising revenue as income. Revenues from display advertising for all media amounted to US $120 million in 1998. Television held the largest share of media advertising revenues at 40 percent, followed by newspapers at 32 percent, magazines at 10 percent, and radio at 3 percent. Government agencies are the largest advertiser, accounting for 30 percent of all advertising in national newspapers. The government has considerable leverage over the press through its substantial budget for advertising and public interest campaigns, its control over newsprint, and its ability to enforce regulations. For example, the country's leading Urdu daily, Jang , and the English-language daily News , both owned by Shakil Ur-Rehman, were cut off for a time from critical government advertising revenue after publishing articles unflattering to the government. The Jang Group was also served with approximately US $13 million in tax notices, harassed by government inspectors, and pressured not to publish articles. Jang also reportedly had difficulty obtaining sufficient newsprint to publish. Due to pressures from national and international organizations, the trend is toward greater press freedom and democracy. Although the government is the press's largest advertiser, privatization of major industries and banks is causing the government to lose its control over the press and is attempting to counter this trend by enforcing new restrictions. Digicom, a private e-mail provider, brought Internet access to Karachi in 1995. 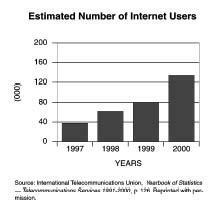 Nationwide local access was established within one year, and by 1999 was available to 600,000 computers, 60,000 users by 3,102 Internet hosts. Internet capabilities provided news media with a means for reaching overseas Pakistanis. All leading newspapers, including Jang , Nawa-e-WaqtDawnThe Nation,The News International , and Business Recorder , have online editions. In addition, Pakistan Broadcasting Corporation and Pakistan Television Corporation both have web sites accessible to the public. Three main groups dominate Pakistan: the Jang Group, the Herald Group, and the Nawae-Waqt Group. Jang Publications is the largest media group and holds a virtual monopoly of Urdu readership in Sindh, Rawalpindi-Islamabad federal territory, and major shares in Lahore and Quetta. Jang also publishes the largest circulating weekly magazine in Urdu, Akhbare-Jehan , and two evening papers, the Daily News and Awam . The News , the first Pakistani newspaper to use computers in all steps of production, is also a publication of the Jang Group. Pakistan Herald Publications Ltd. publishes Dawn , which has had a dominant hold over Karachi readership. The Herald Group also publishes the Star (an English evening paper) and The Herald (an influential English monthly). The group also began a monthly that focuses on the Internet, entitled Spider . Publications under the Herald Group target the upper class and the better-educated segment of Pakistani society and consequently practice a liberal editorial policy. The Nawa-e-Waqt Group publishes Nawa-e-Waqt and also started The Nation , an English daily. This group also publishes Family , an Urdu weekly. Several other significant groups and independent publications also exist. The notable daily newspaper chains that have started during the late 1990s and early 2000s include Khabrain , PakistanAusaf , and Din . The Frontier Post , Business Recorder , and Amn are also other important dailies. Political parties own two major newspapers: the Jasarat , controlled by the conservative Jannat-e-Islami, and Mussawat , controlled by the Pakistan People's Party. From 1964 into the early 1990s, the National Press Trust acted as the government's front to control the press. The state, however, no longer publishes daily newspapers; the former Press Trust sold or liquidated its newspapers and magazines in the early 1990s. The majority of Pakistan's newspapers and magazines strive for national readership. Such major successful dailies are published simultaneously from a number of cities and are produced in different languages to facilitate distribution throughout the country's various regions. Distribution is through a network of newspaper hawkers; in smaller towns, hawkers also serve as stringers for newspapers. Buses are used for nearby distribution and airfreights are utilized for faraway cities when schedules permit. Ministry of Information and Broadcasting. This practice allowed the government to patronize sections of the press. In April 1989, Prime Minister Benazir Bhutto's government decided to end this manipulative practice. By replacing the permit system with a free and open import of newsprint at market prices, the government removed its interventionist dimension in controlling an essential raw material for the press and also ended the corruption that had grown up around the issuance and receipt of the newsprint import permits. In 1991, however, the first government of Prime Minister Nawaz Sharif restored the system of issuing permits. The Audit Bureau of Circulation, which functions under the Ministry of Information and Broadcasting, was responsible for assessing the circulation and print orders of newspapers and magazines and issuing certificates legitimizing these figures. The bureau certificates became the basis on which journals were able to import proportionate quantities of newsprint and secure government-controlled advertising through the clearance given by the Press Information Department. Corrupt practices have been associated with the ABC operation. 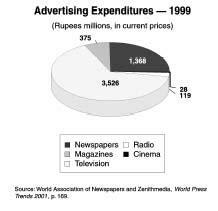 The current government of General Musharraf has considerable leverage over the press through its control over newsprint, its substantial budget for advertising and public interest campaigns, and its ability to enforce regulations. Privately owned newspapers freely discuss public policy and criticize the government. They report remarks made by opposition politicians, and their editorials reflect a wide range of views. The effort to ensure that newspapers carry their statements or press releases sometimes leads to undue pressure by local police, political parties, ethnic, sectarian, and religious groups, militant student organizations, and occasionally commercial interests. Such pressure is a common feature of journalism and can include physical violence, sacking of offices, intimidation and beating of journalists, and interference with distribution of newspapers. Journalists working in small provincial towns and villages encounter more difficulties from arbitrary local authorities and influential individuals than their big-city counterparts do. Violence against and intimidation of journalists, however, is a nationwide problem. Government leaks, although not uncommon, are managed carefully; it is common knowledge that journalists, who are routinely underpaid, are on the unofficial payrolls of many competing interests, and the military (or elements within it) is presumed to be no exception. For example, according to the All Pakistan Newspaper Society, favorable press coverage of the Prime Minister's family compound south of Lahore was widely understood to have been obtained for a price. Rumors of intimidation, heavy-handed surveillance, and even legal action to quiet the unduly curious or nondeferential reporter are common. Special-interest lobbies are not in existence in Pakistan as in the United States and elsewhere, but political pressure groups and leaders include the military, ulema (clergy), landowners, industrialists, and some small merchants. Several unions represent Pakistani newspapers and their respective journalists. Editors and other management-level employees belong to the All Pakistan Newspaper Society and/or the Council of Pakistan Newspaper Editors. Other employees, including reporters, belong to the Pakistan Federal Union of Journalists (PFUJ) and/or the All-Pakistan Newspaper Employees' Confederation (APNEC). These groups have been actively involved in reviewing the government's draft of the Press Council of Pakistan Ordinance 2002 and the draft of Press, Newspaper Agencies Registration Ordinance 2002. APNEC and PFUJ and all their affiliated unions and units rejected the proposed setting up of a press council and press regulatory laws that the government decided to introduce to regulate the press. Journalists objected to the inclusion of government representatives and the exclusion of working journalists from what was supposed to be a self-regulating rather than government-directed body. Previous legislation created under Prime Minister Benazir Bhutto included a new wage board under the Newspaper Employees (Conditions of Service) Act 1973. Several years had lapsed since the previous award had been announced. Inflation as well as the preference of certain newspaper publishers to engage staff only on a contract basis meant that wages were no longer reflective of the cost-of-living realities. One media scholar estimated that well over 50 percent of newspaper employees are deliberately employed on a contract basis to avoid the enforcement of relevant industrial relations laws and awards by wage boards. In fact, at a 2002 World Press Freedom Day seminar in Karachi, journalist Sajjad Mir stated that very few newspapers in the country had implemented the Wage Board Award for journalists and employees. Newspapers in Pakistan are mostly printed on offset. Printing and editing technologies have improved newspaper production over the years; however, the impact on circulation has not been significant. Every citizen shall have the right to freedom of speech and expression, and there shall be freedom of the press, subject to any reasonable restrictions imposed by law in the interest of the glory of Islam or the integrity, security or defense of Pakistan or any part thereof, friendly relations with foreign states, public order, decency or morality, or in relation to contempt of court, commission of or incitement to an offense. The Constitution of Pakistan, then, guarantees the freedom of expression and freedom of the press, subject to "reasonable restrictions" that may be imposed by law. It is the responsibility of the judiciary to determine the scope and parameters of the permissible freedoms and the extent of restrictions placed on their enjoyment. The judiciary can play a full and effective role only if it is free and independent of any and every kind or form of control or influence. Although the judiciary has generally been supportive of the freedom of expression and information, and sought to strengthen the mass media, the courts are subject to pressure from the executive branch because the president controls the appointment, transfer, and tenure of judges. The position of the judiciary has been affected by periods of military rule, and a blow was dealt to the judiciary in January 2000 when Musharraf required all judges to take an oath of loyalty to his regime. The Supreme Court Justice and five colleagues refused and were dismissed. This was just one week before the Court was to hear cases challenging the legality of Musharraf's government. The constitution also outlines the power of the president to promulgate ordinances and to suspend fundamental rights during an emergency period. Thus, following Musharraf's military takeover on October 12, 1999, he suspended Pakistan's constitution and assumed the additional title of Chief Executive. He appointed an eight-member National Security Council to function as the supreme governing body of Pakistan. He dissolved both the Senate and the National Assembly. New legislation has been drafted for the formation of Press Council, Access to Information Ordinance and Press, Newspapers and Books Registration Act. On May 16, 2002, the Minister of Information, along with the Council of Pakistan Newspaper Editors and the All Pakistan Newspaper Society, released drafts for the legislation for comment and debate. Newspaper editors also urged that the Freedom of Information Act and the amended Registration of Printing Press and Publication Ordinance be promulgated by the government, along with the Press Council Ordinance. The International Press Institute (IPI) identified major concerns including the desire to create a quasi-judicial body without proper procedures in place to provide fairness and equity. The IPI also expressed reservations about the proposed composition, its financing, and the terminology used in describing the ethical code, and made a number of recommendations for improving the draft ordinance. The PFUJ and the APNEC reacted in similar ways to the proposed legislation. In a joint statement issued on the eve of World Press Freedom Day, leaders of the two organizations said they regretted that the Press and Publication Ordinance against which the journalists' community had striven for almost two decades had once again been revived and newspapers were being closed down under the same black law. The statement said fresh attempts in the shape of the Press Council were being framed by Musharraf's government to silence the voice of the print media in the country. They said the PFUJ and APNEC had already rejected the idea of setting up the council and that news people were still being subjected to different pressure tactics, including threats to their lives. They demanded that the government repeal more than 16 black laws, including the Press and Publication Ordinance, and to insure implementation of the labor laws by ending exploitation of the working journalists and newspaper workers. They also called for enforcing the Freedom of Information Act to ensure easy access to information. The only other press laws in effect while the current proposed press laws are under review are general ones prohibiting publication of obscene material, inciting religious, parochial, or ethnic provocations, and anti-defamation provisions. A Print, Press and Publications Ordinance, requiring the registration of printing presses and newspapers, was allowed to lapse in 1997 after several years of waning application. In practice, registering a new publication is a simple administrative act and is not subjected to political or government scrutiny. There are no registration or licensing processes for journalists. New newspapers and presses are required to register themselves with the local administration. Censorship pervades journalism history in Pakistan; certainly, the blackest censorship period came during General Zia's 10-year military regime. Almost all journalists mention the press advice system as one of the most insidious means of censorship. It specified that whoever "contravenes any provision of this regulation shall be punished with rigorous imprisonment which may extend to ten years, and shall be liable to fine or stripes [lashes] not to exceed twenty-five." Sharif used additional means to ensure press compliance. He used intelligence operatives to infiltrate newsrooms and press unions. With so many spies doubling as reporters, and journalists moonlighting as government agents, trust became difficult for all. The Ministry of Information and Broadcasting monitors the press. It also controls and manages the country's primary wire service, the Associated Press of Pakistan (APP). APP is both the Govern-ment's own news agency and the official carrier of international wire service stories to the local media. Foreign books must pass government censors before being reprinted. Books and magazines may be imported freely, but are likewise subject to censorship for objectionable sexual or religious content. English language publications have not been affected by the direct proscription of books and magazines promulgated by the Chief Commissioner in Islamabad, who banned five Sindhi-language publications in the second half of 1997 for "objectionable material against Pakistan" (i.e., expressions of Sindhi nationalism). The press has traditionally experienced the often harsh effects of Pakistan's political instability. When partition resulted in the establishment of Pakistan as an independent homeland for the Muslims, the Muslim League as a political party struggled with the tasks of leading the new country into stable statehood. Factionalism, however, quickly contributed to instability, internal strife, incompetence, and corruption. The press at this point was largely a remnant of the Moslem press present during the struggle for independence, and it was seen as aggravating the problems being faced by keeping these issues out in front of the people. Thus, the government began its long history of attempting to control the press through arrests, the banning of certain publications, and other punitive measures. Between 1948 and 1956, political turbulence intensified with the assassination of the country's first prime minister, Quaid-i-Millat Liaquat Ali Khan, in 1951 and the dissolution of the Constituent Assembly in 1954. However, by 1956, the Constitution of the Islamic Republic of Pakistan was enforced; it contained an article specifically devoted to freedom of speech. The 1956 Constitution lasted less than three years when it was abrogated by the imposition of martial law in October 1958. A new enforcement of the constitution in 1962 occurred with the removal of martial law by President Ayub Khan. Although this constitution continued the recognition of an initial concept of freedom of expression, in reality, a military ruler imposed the constitution, and it contained no separate chapter on fundamental rights. The press and the public commented on the implications of living under a constitution devoid of mention of such basic rights, which resulted in Constitutional Amendment No. 1 to the 1962 Constitution. However, in 1963, just one year after the adoption of the new constitution, the Press and Publications Ordinance (PPO) came into being. This ordinance contained the harshest of laws curtailing freedom of expression and the progressive development of the media and leading to the March 1969 relinquishing of power by President Ayub Khan to General Yahya Khan who imposed martial law. General Khan relied heavily on one of the measures of this ordinance, the system of "press advice" given out by the Ministry of Information and Broadcasting in order to avoid publication of news and reports deemed unsuitable for public consumption. It was also during this period that newspapers and magazines known for their independent and progressive views were first taken over by the government. Eventually the National Press Trust, created in 1964, took over these journals and acted as a front to control a section of the press. In 1960, the Western Pakistan Maintenance of Public Order Ordinance was promulgated. On the outside, the aim was to consolidate into one law different provisions for "preventive detention of persons" and "control of persons and publications for reasons connected with the maintenance of public order." The real aim was to refine and reinforce the mechanism of repression. With amendments in 1963 and 1964, this law empowered the government to ban the printing of publications, to enter and search premises, and to prohibit import of newspapers, among other measures. These powers have been used by succeeding governments right up until the government of Musharraf. In 1961, the government also took over the principal news agency of the country, the APP, arguing that "administrative and financial breakdown" justified such a move. Instead of allowing private enterprise to improve the quality of the news agency, the government saw this as an opportunity to control what news would be supplied to the print media, to radio, and to the outside world. In spite of such repressive times, the press took a bold stand in providing alternative sources of news through an independent press. It was also during this time that the Press and Publications Ordinance collected under one law a number of excessive regulatory measures and punitive concepts that had previously existed in different laws and were now applied heavily to control the press. This press law (PPO) endured for 25 years before being repealed in September 1988. In December 1971, when the break-up of Pakistan and the birth of Bangladesh occurred, General Yahya Khan handed over power to Zulfikar Ali Bhutto as President and Pakistan's first civilian Chief Martial Law Administrator who continued to use martial law up to April 1972 when an interim constitution was adopted, prior to the enactment of a new constitution by the National Assembly in August 1973. Bhutto, however, reacting to criticism by various members of the press, imprisoned editors and publishers on the pretext of national security. The next five years, from 1972 to 1977, represented the beginnings of democracy; however, they were marred by repressive actions toward the press. The new constitution, although formulated on the principles of democracy, human rights, and freedom of speech, did not deliver on these promises. The PPO remained, as did the National Press Trust. Furthermore, through coercion and manipulation, the government insured that the only other news agency in the country (aside from the government-owned APP), the Pakistan Press International (PPI), was brought under its authority. In 1977, General Zia ul Haq ousted Bhutto from the prime minister position and once again imposed martial law under which abuse of journalists became public rather than covert. Journalists were flogged in public at Zia's whim. Although martial law usually ends with a Supreme Court-imposed deadline by which elections must be held, Zia was given no such deadline, and his time in office up to August 1988 had a deleterious effect on the mass media. Not one single law or regulation of any progressive character was created during Zia's rule. The only positive outcome of Zia's rule was the restoration of the news agency PPI to its original shareholders. Since then PPI provides a valuable alternative news source to the government-controlled APP. In 1985, Prime Minister Mohammad Khan Junejo was elected to the National Assembly, based on nonparty elections, and lifted martial law in December 1985. Even though Junejo was a more democratic political figure, the PPO remained in place under him, and he relied on the old media laws. However, in May 1988 President General Zia ul Haq dissolved the National Assembly and dismissed the Government of Prime Minister Junejo, replacing them with a cabinet of his own and no prime minister. This arrangement only lasted 11 weeks as Haq was killed in a suspicious plane crash in August 1988. This incident resulted in the Chairman of the Senate, Mr. Ghulam Ishaq Khan, succeeding to the office of President as per the constitution. A caretaker government provided transition to a full-fledged democracy, which included repealing the press law that had coerced the media for so long. A new law, known as the Registration of Printing Presses and Publications Ordinance came into effect in 1988. A key change in this law made it mandatory for the District Magistrate to issue a receipt to an applicant for the issuance of a declaration for the keeping of a printing press or the publication of a journal to provide the applicant with proof that would help avoid government interference. The most significant change made in the press law of 1988 was the removal of power from the government and the right of an applicant to be heard in person by the authority before any punitive action was taken, like the closure of a press. Appeals were also now allowed. In addition, newspapers were no longer obligated to publish in full the press notes issued by the government. For a variety of reasons, the press law of 1988 continued to be re-promulgated as an ordinance through 1997, even though the Supreme Court ruled such re-promulgation unconstitutional. One key reason for this was the recurring demands by representative bodies of the press to revise the 1988 law even further to remove any executive power to control the press. The November 1988 elections saw Prime Minister Benazir Bhutto, the first Muslim woman prime minister of the world, assume office. She brought with her a new phase of liberalism toward the mass media laws and regulations. For example, Bhutto's government allowed government-controlled radio and television to provide daily and well-balanced coverage of the speeches and statements of its opposition in news bulletins and current affairs programs. Because the print media reaches such a small percentage of the population, this change had a significant impact on the pubic, but was returned to the old, one-sided coverage after only four months because of pressure on Bhutto by her party, the Pakistan People's Party. The independent press grew stronger during this phase; the Urdu press and the English press, as well as the regional language press, such as Sindh language newspapers, showed a new energy in reporting the news and in analyzing the issues of the day. In addition, new technology and use of computers and desktop publishing allowed a more timely and in-depth reporting of the news. Bhutto also ended the manipulative government practice of using newsprint as a means of controlling the press. Specifically, the Ministry of Information no longer required issuance of permits to import newsprint and allowed a free and open system of importing newsprint at market prices. In 1990, President Ishaq Khan dismissed Bhutto's government, charging them with misconduct, and declared a state of emergency. Bhutto and her party lost the October elections, and the new prime minister, Nawaz Sharif, took over. For reasons not apparent to the public, Sharif restored the issuance of permits system for news-print import. The charges against Bhutto were resolved, and after a bitter campaign, the PPP was returned to power in October 1993, and Bhutto was again named prime minister. She was ousted again in 1996 amid charges of corruption, a caretaker government was installed, and Sharif defeated Bhutto in the February 1997 elections. In Sharif's two and one-half years in power, he used many heavy-handed methods to deal with journalists who dared to criticize his government. He put tremendous pressure on independent journalists, using both covert and overt means of retribution. His Pakistan Muslim League party (PML) achieved a landslide electoral victory in the National Assembly, which made Sharif believe he had been given a "heavy mandate" to rule the country as he saw fit. He was able to cast aside all democratic checks on his power, except for the press. In the end, the press survived whereas Sharif did not. The press, in fact, through its wide reporting of Sharif's abuse of power, prepared the Pakistani people for General Pervez Musharraf's military coup on October 12, 1999. In May 2000 Musharraf's regime was strengthened by a unanimous decision by the Supreme Court to validate the October 1999 coup as having been necessary; at the same time the Court announced that the Chief Executive should name a date not later than 90 days before the expiry of the three-year period from October 12, 1999 for the holding of elections to the National Assembly, the provincial assemblies, and the Senate. In Pakistan today a cooperative effort appears to be underway between Musharraf's government and the journalism community. In general, Musharraf's administration seems to follow a more liberal policy towards the press with fewer restrictions and much less manipulation. However, reports vary widely. Whereas the Pakistan Press Foundation (PPF) reported continued harassment of and dangers to journalists, some journalists currently working for Pakistani newspapers offer another version of the situation. A. R. Khaliq, assistant editor for Business Recorder , reported that "the press, by and large, is not faced with any coercion or abuse under Musharraf." The official Press and Information Departments under the Ministry of Informationhandle accreditation procedures for foreign correspondents. Special visas are required if long stays are intended. Pakistan rarely grants visas to Indian journalists or journalists of Indian origin. The presence of foreign journalists in Pakistan has intensified with the United States' search for Osama bin Laden after the terrorist attacks of September 11, 2001. Pakistan's proximity to Afghanistan provides the media with a base from which to operate as they report the news to the world. The killing of American journalist Daniel Pearl by extremists in Pakistan brought much unwanted attention to Musharraf's government, and the United States has urged Pakistan's government to place a ban on the publications of as many as 22 magazines that serve as propaganda machines of the different religious and Jihadi organizations, which appear from Karachi, Lahore and Muzaffarabad. The ban is the extension of measures set by the United Nations Security Council Sanction Committee and the United States government against the terrorist individuals and entities. Previous press laws included provisions restricting foreign ownership in the press. The law specified that a non-citizen of Pakistan could hold shares in any newspaper only with the previous approval of the government and only if such participation in ownership did not exceed 25 percent of the entire proprietary interest. Information on foreign ownership provisions in the proposed new press laws is unavailable. International press organizations are very active in Pakistan, especially in terms of monitoring the freedom of the press. The Pakistan Press Foundation, for example, is a nonprofit media research, documentation and training center committed to promoting freedom of the press in Pakistan and internationally. The foundation produces PPF NewsFlash , a service designed to highlight threats to press freedom in Pakistan. The International Press Institute, a global network of editors, media executives, and leading journalists dedicated to the freedom of the press and improving the standards and practices of journalism, not only sponsors the annual World Press Freedom Day but also provides a World Press Freedom Review on journalism in Pakistan and the other 110 member countries. This organization was instrumental in sponsoring various seminars on World Press Freedom Day that allowed national debate and focus on the proposed new Press Council and press laws. A third organization, Committee to Protect Journalists, is a nonprofit, nonpartisan organization dedicated to the global defense of press freedom. This organization publishes special reports such as its 2000 publication of "Pakistan: The Press for Change." They also maintain a web site with regional homepages covering each country. The Ministry of Information controls and manages the country's primary wire service, the APP. APP is both the government's own news agency and the official carrier of international wire service stories to the local media. The launching of a Web site by APP enables readers to browse and download the latest news. The news service is now directly fed into the computers of the subscribers simultaneously throughout Pakistan and overseas. Besides publishing in the English language, APP also issues news items in Urdu. The other primary news agency in Pakistan is the PPI, a private independent news agency. Several other news agencies have also emerged in recent years, some funded by political groups. The few small privately owned wire services are circumspect in their coverage of sensitive domestic news and tend to follow a government line. Foreign news bureaus include Agence France-Presse (France), Agenzia Nazionale Stampa Associata (Italy), Associated Press (United States), Deutsche Presse-Agentur (Germany), Inter Press Service (Italy), Reuters (United Kingdom), United Press International (United States), and Xinhua News Agency (People's Republic of China). All are located in the capital of Islamabad. The broadcast media are government monopolies. The government owns and operates the bulk of radio and television stations through its two official broadcast bureaucracies, the Pakistan Broadcasting Corporation and Pakistan Television. Domestic news coverage and public affairs programming on these broadcast media are closely controlled by the government and traditionally have reflected strongly the views of the party in power. Television reaches 86 percent of the population covering only 37.5 percent of the territory. The privately owned Shalimar Television Network broadcasts foreign programs including CNN and BBC. However, the network censors segments that can be considered socially and sexually offensive by Pakistani standards, and the government censors morally objectionable advertising. All stations must use news bulletins produced by Pakistan Television. The greatest impact on broadcasting so far has been the introduction and popularity of satellite dishes. Satellite enables access to STAR TV, BBC, CNN, as well as other channels providing important news and entertainment. Radio reaches almost 100 percent of the population. Pakistan Broadcasting Corporation broadcasts its external service to 70 countries in 15 languages. Each station broadcasts local news and interests. The majority of the programs pertain to music (48 percent), religion (12.5 percent), and news and current affairs (11 percent). 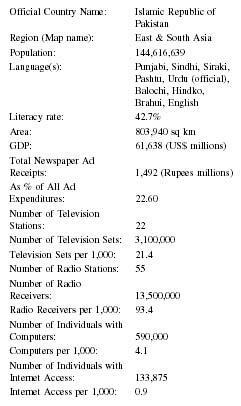 In 1995-96, government grants, advertisements (11 percent), and licensing fees (2.3 percent) funded 85 percent of Pakistan Broadcasting Corporation. The decreasing trend in advertising created an increased dependence on the government for funds. The government is also a major shareholder in the private station, Shalimar Recording. The Pakistan Press Foundation is actively involved in training of journalists. The foundation regularly organizes workshops and seminars on important issues facing Pakistani media. Along with imparting basic training to rural journalists, the training program aims to raise awareness of rural journalists about their rights and responsibilities. Pakistan Press Foundation's training activities also include the Rural Journalists Skills Development Program that focuses sessions on press freedom, rights of journalists and journalistic ethics. Plans are underway in the 2000s to create training courses to improve the efficiency of information officers and later to open those courses to the media community. In addition, reference libraries are planned for Karachi and, later, research cells at all information centers in the provinces so that news people would have easy access to background materials in their areas of operation. In addition, accreditation cards would be issued to working journalists to help them perform their duties; these would be issued according to accreditation laws and the opinion of accreditation committees. Pakistan's turbulent history, coupled with its ongoing political and economic crises, places the press in the position of informing the citizenry while also providing a check on the powers in office. Since its founding in 1947, Pakistan has suffered three periods of martial law and two military dictatorships, yet the press endures. The freedoms that insure the existence of the press are contained in Pakistan's constitution, which remained suspended in 2002, and yet the press endures and continues to safeguard those freedoms. Over the years members of the press have been arrested and jailed, have had their offices raided and ransacked, have been publicly flogged, and severely censored. Yet the press endures and has a stronger voice today than ever before, and yet as recently as 1999, Pakistan's largest and most influential newspaper, Jang , was raided because it was too critical of the government. Watch groups around the world characterize Pakistan as a "partly free" nation, and efforts appear to be moving in a positive and democratic direction. Members of the Pakistan press must work diligently to have their voices heard in the government's attempt to create a Press Council and new press laws. As of mid-2002, no date had been set for the mandated elections that are to occur at the end of Musharraf's three-year rule, but former Prime Minister Benazir Bhutto is expected to return to Pakistan to participate in the elections. She has asked a number of international news organizations to accompany her back to Pakistan, which will keep Pakistan in the headlines in the future. Problems facing the Pakistan press are not new, nor are there any quick fixes to them. Recent arrests of respected Pakistani journalists have spurred concern. Pakistan is dependent upon foreign aid, however, and is thus vulnerable to international pressures, which should help the plight of journalists being abused. In addition, a new generation of female editors who are sensitive to the abuses otherwise ignored by their male counterparts will undoubtedly help journalists and human rights victims. 1997: Nawaz Sharif defeats Benazir Bhutto in the elections and begins a two-and-a half year reign of terror against the press. 1999: General Pervez Musharraf overthrows Sharif, suspends the constitution, and declares martial law; government agents raid the country's most influential newspaper, Jang , because it was too critical of the government. 2001: Government introduces legislation to create a Press Council and new press laws. 2002: Journalists support the reintroduction of the Freedom of Information Ordinance Act allowing access to public records and details of decisions made by superior courts, armed forces, financial institutions, and intelligence agencies. "About Us." Pakistan Press Foundation. Available from http://www.oneworld.org . Ali, Owais Aslam. Pakistan Press Freedom Report 2000 . Available from http://www.oneworld.org . All Pakistan Newspaper Society. Available from http://www.bol.ucla.edu . Bhatti, Razia. A Profile in Courage: The Newsline Editorials of Razia Bhatti, 1989-1996 . Karachhi, Pakistan: OUP, 2001. Blood, Peter R., ed. Pakistan: A Country Study. 6th ed. Washington, DC: Federal Research Division, Library of Congress, 1995. Bonk, Marie Rose, ed. Worldmark Yearbook 2001 . Vol. 2. Farmington Hills, Mich.: Gale Group, 2001. "Country Profile: Pakistan." Facts on File News Services. Available from http://www.2facts.com . Human Rights Commission of Pakistan. Courage in Journalism: The Right to Know. Seminar on the Right to Know and Presentation of the First Nisar Osmani Award Lahore, Pakistan: Author, 1996. Jabbar, Javed, and Qazi Faez Isa. Mass Media Laws and Regulations in Pakistan and a Commentary from an Historical Perspective . Singapore: Asian Media Information & Communication Centre, 1997. Khaliq, A.R., assistant ed. Business Recorder . Available from . Menon, Kavila. Pakistan: The Press for Change: A Special Report . Committee to Protect Journalists, Briefing Index 2000. Available from http://www.cpj.org . Niazi, Zamir. The Web of Censorship . Karachi, Pakistan: OUP, 1994. ——. The Press under Siege . Karachi, Pakistan: Karachi Press Club, 1992. ——. Press in Chains . Delhi: Ajanta Publications, 1987. "Pakistan." CIA: The World Factbook . Available from http://www.cia.gov . "Pakistan." UNICEF Statistics (Last updated 1 Feb. 2002). Available from http://www.unicef.org . "Pakistan Broadcasting Corporation." Available from http://www.radio.gov.pk . "Pakistan History." Official Pakistan Government Web site. Available from http://www.pakistaninformation.com . Does large corporataions influence Pakistani media? Can you name few of these corporations or powerful people who have a resounding effect on media and how? its a excellent collection. great information, very helping material for the student of journalism and studnts doing research on "Freedom of Press". this can help more and they can update their missing knowldge. i want register a news paper can someone help me how to complete the whole process. and what is the process of news paper registration.and other details like education requirements etc. Hi everyone! I do agree that it's a very good work, so helpful to my studies on press freedom in Pak!!! But I would like to know the exact year of this publication. (It seems to me that 2002 is the answer, following few clues in the text. But if somebody knows the exact year, please write me back!) Futhermore, do you think that most of these informations can apply on today's Pakistan press? Hi dear i want to register my new newspaper can you help me in this . please do the needful m waiting for your rpely . i need the exact data on " to what % violence has increased due to television and media?" can anyone provide me that? "Role of print media for sports promotion"
very good information and very helpful material to Mass Communication student.such a great information as i am facing lots problem in my assignments. Very Informative,Such informations are very much important for the students. can you tell me about pakistan press tinternational agency? my professor given me assignment to write the agency Pakistan Press International...I'll be very thankful, and being urgent, it should be submitted by the beginning of April as I have to show the assignment by the middle of the month. Someone told me that you can help me. Very informative collection. It can be used in the classes of Universities and I also have read it as reference material. It will be great if it would be updated. Great work. Please Provide the sources used for this article Thanks in advance.